Here are a few tips and ideas you might want to consider for your next kitchen project. As with any remodel you will want to assess your own priorities and budgetary requirements prior to making any final decisions or commitments. Where there is a dull, consecutive appearance of a flat ceiling area, a bayed section over an island or perhaps other main area can help break up the confinement of common or similar level ceiling heights. As an option to typical drywall, ceilings could be beamed, tin, tile or even natural stone for tastes of an exotic feel under the right circumstance. Kitchen cabinets represent one of the most sizable investments in your home and so extra care should be taken in their selection. Choices come in stock (or called “standard”), semi-custom and “custom cabinets” with prices varying considerably. But if cost is a main concern, you may simply want to consider refacing your existing cabinets, or repainting to achieve a color-coordinated facelift. Painting wood cabinetry and applying special finishes is a great way to conserve on budget while yielding custom-grade results, if you are so adept. One notable difference in cabinets is a frameless versus framed design (where the frame is viewable from the outside.) The frameless option does offer a more compact storage solution of the two, and lacks the center support giving you more easily accessible storage. And if storage space is a concern, you may too want to consider the possibilities of kitchen closet organizers. One project that can contribute enormously to the appearance of your kitchen is either a stone or tile backsplash. Adding this, is not too difficult a procedure and can be coordinated with floor tile and counters areas to break up the monotony and bring in some life behind your workspace. Many of the advantages and disadvantage of the different floor types in the kitchen (such as durability, ease of clean-up, continued maintenance, etc) are put to the test in the kitchen since it is one of the highest traffic areas of the home. While tile seems a natural fit for many kitchen spaces, keep in mind that tile usually requires maintenance in the form of sealing and regrouting at some future time. Concerns, that have been addressed by some extent by makers of contemporary laminates and engineered flooring materials. Keep in mind, your existing flooring and any efforts to tear it up and replace – there are some contractors who will set tile over existing laminates or laminate successively, added layers on top, while other contractors are not in the practice of so doing. Note: If the existing flooring was run under your present cabinets, this may affect any efforts at replacing. Occasionally base cabinets need to be pulled in order to access the old flooring, and/or to accommodate a change in heights. The installation of your floor does uniquely influence the sense of scale and direction. With cabinets already or planned-to-be in place, and with the plumbing/sink already occupying a predetermined place, there is a decent chance the wall space available will be at a premium. This means that maximizing opportunities can be important with garden windows over the sink, or a bay window unit extending out through a main wall. Not only will you be given additional lit space by these (or from a skylight overabove) but if your windows happen to come screened, they may bring in some much needed ventilation to the room. For artificial lighting, task lighting over the cabinets can add to functional appearance. Noting that for any ceiling lighting to be added, it may first prove worthwhile to check into whether there is access, like from an attic, which makes makes wiring more practical (depending on which direction the joists run). Taking the proactive approach of planning an organized progress schedule to your kitchen remodel project is important. Remember, this is one of the most relied on areas of the home. Taking the proper time before the start of project and working in cooperation with your remodeler cannot only make this a bearable experience but it can make a key difference in the time to completion, the way the remodeling project progresses, finishes and completes. Possibly having you back in the kitchen faster than expected. Considers wider implications when putting in cabinets, from layout and hardware, to finishes and appliance panels. For the custom cabinet, book matching grains, and more. 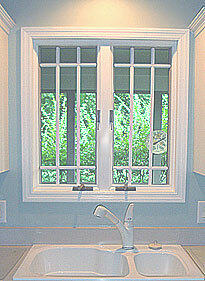 Kitchen Counters & Remodeling - considers integrating the counter in the remodel. Kitchen Counter Ideas - presents a bigger picture for the process of making a new counter a reality in the kitchen. Kitchen Granite & Painting - there is a relationship between your granite and painting that should be coordinated to get the best results. Includes the preferred sequence, caulking and color	selection for a successful outcome. Kitchen Granite Countertops - about granite as it pertains to the kitchen area, covering gloss, honed surfaces and how it is customized for design purposes.